For millions of pets and people, the tiny flea is a remorseless enemy. The flea is a small, brown, wingless insect that uses specialized mouth parts to pierce the skin and siphon blood. Before we start with our list of the best flea shampoos for cats, lets see what fleas can do to your cat. A small hive may develop at the site of the fleabite, which either heals or develops into a tiny red bump that eventually crusts over. 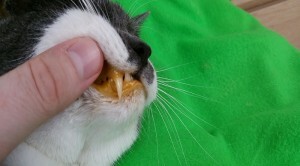 The cat may scratch and chew at herself until the area is hairless, raw and weeping serum (“hot spots”). This can cause hair loss, redness, scaling, bacterial infection and increased pigmentation of the skin. The distribution often involves the lower back, base of the tail, toward the back, the abdomen, flanks and neck. It may become quite generalized in the severe case, leading to total body involvement. Remember that the flea spends the majority of its life in the environment, not on your pet, so it may be difficult to find. In fact, your cat may continue to scratch without you ever seeing a flea on her. 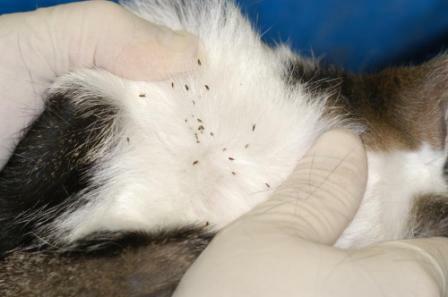 If your cat ends up being infected by a flea, the next step is the treatment. Types of commercial products available for flea control include flea collars, shampoos, sprays, powders and dips. Other, newer, products include oral and systemic spot-on insecticides. Nevertheless, cat flea shampoos have proved to be the most effective remedy.When you look for flea shampoo for cats, try to find one that works on both living adult fleas and flea eggs. Fleas need to be eliminated on all stages of their lifecycle, or else they’ll just keep coming back. Flea shampoo that only kills adult fleas is probably a little cheaper than the one that does both, but I don’t think it’s worth it because you just end up repeating flea baths instead. Another thing that varies in flea shampoo for cats products is the active ingredient. Most commonly used is pyrethrins, which is an insecticide. This might be a bit too strong for smaller pets and puppies, so you should look for a more natural flea shampoo for these. One of the best things with cat flea shampoos is the fact that you can use it as a sort of prevention. In other words it would be wise to use the kitten flea shampoo on a healthy kitten, from time to time just to be safe, and know that you have done all you could for your cat. 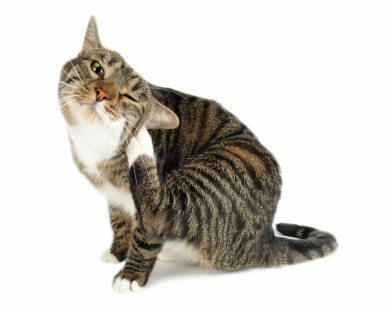 In order to help you decide which cat flea shampoo would be the best for your pet, we have created a list of the best cat flea shampoos available on the market. So, let’s start. As the name already suggests, this shampoo can be used on both cats and dogs with a flea infection. This shampoo is also known as the bestseller when it comes to cat flea shampoos. The price of a 12 ounce package is around 14$ and it is definitely worth the money. It kills fleas, ticks, flea eggs, flea larvae, and lice; so it is harmful for all flea stages. It contains soothing aloe, lanolin, coconut extract, and oatmeal, and provides 28 days of control when it comes to pre-adult fleas. What’s best, it can be used on both kittens and adult cats. 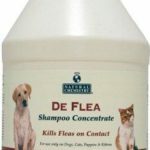 De flea shampoo kills fleas on contact without the use of pyrethrin based perticides. 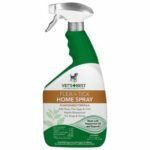 With the active ingredients in this product works together to soften the waxy exoskeleton of fleas, ticks, lice, mites and other insects. De flea works for all stages of an insects life cycle from eggs, larvae, pupae to adult. It is also effective on ticks and lice. It is safe for both people and cats or kittens of any age, and ready to use with no need of any mixing. It comes in a 8 ounce plastic bottle, at a cost of around 11$. This Flea and Tick shampoo of a baby fresh scent, comes in a 12 ounce bottle, at a price of around 16$. Its rich, creamy formula soothes sensitive skin, cleans and conditions the cat’s fur and leaves it shiny and manageable. The ingredients it contains prevent flea eggs from hatching for 28 days . The formula also kills adult fleas, ticks and lice on contact. As opposed to the previous two cat flea shampoos, this one cannot be used on kittens under 12 weeks old. 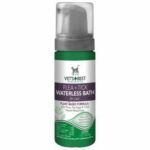 Vet’s Best Natural Flea and Tick Waterless Bath for Cats comes in a 5 ounce bottle, at a price of 11$. It kills fleas, flea eggs, and ticks by contact. Repels mosquitoes as well . Foaming waterless shampoo is easy to use and doesn’t require rinsing. It is perfect for cats who don’t like baths or sprays. Naturally cleanses and deodorizes cat’s fur with no added fragrance. Carefully and naturally formulated with cats in mind using a unique and effective blend of certified natural oils. Use this cat flea shampoo as directed on cats of 12 weeks and older. This both shampoo and conditioner costs above 11$ approximately and comes in a 18 ounce plastic bottle.It is formulated with Permethrin, and it kills ticks and fleas on contact. This soap and paraben free shampoo acts gently on the cat’s fur, as only the gentlest, naturally derived cleansers are used in the formula. It also contains no harsh soaps or damaging detergents.For maximum parasite control allow lather to remain in contact with skin for ﬁve to ten minutes before rinsing. It is safe to use on cats of 12 weeks and older, but it shouldn’t be used more than once a week. 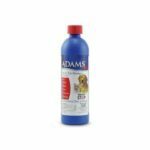 This Flea and Tick spray is a natural repellent to protect your cats from fleas, ticks, mosquitoes and flies. 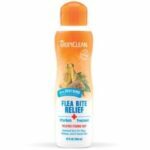 Flea + Tick includes lemongrass, cinnamon, sesame and Castor oils to provide a pleasant and refreshing smell with clean, non-sticky active ingredients. The combination of Brazilian oils from certified forests act as a natural shield from unwanted pests.It does not contain any synthetic chemicals or drugs and it can be safely used on beddings. It comes in a 8 ounce plastic spray, and it is therefore easy to use. The price is around 13$. This product is as the name suggests a cat Flea shampoo concentrate, and it therefore requires the mixing of 3 parts water and 1 part concentrate. It kills fleas on contact without the use of pyrethrin based pesticides, and it is effective on ticks and lice as well. It contains dioctyl sodium sulfosuccinateundecyclenic acid to soften the waxy skeleton of fleas, ticks, lice, mites, and other insects until the internal organs are saturated and the insect quickly dies. Gentle yet powerful and works on all stages of the insects’ life cycle. Will not lose effectiveness over time. It comes in a 1 gallon bottle at a price of 36$. 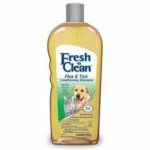 Fresh `n Clean Flea and Tick Conditioning Shampoo is formulated with natural pyrethrins to quickly kill fleas and ticks without the harsh chemicals. However, it will not kill flea eggs. The products residual will weaken the fleas once the eggs hatch. It creates a pleasing fragrance that lasts up to two weeks. Safe for use on dogs, puppies, cats and kittens over 12 weeks old. It also shouldn’t be used more than once a week. The product comes in a 18 ounce plastic bottle, at a price of around 12$. This natural quick action Pyrethrin concentrate provides strong resistance to insect immunity for complete and effective flea and tick control. Apart from flea and tick, it also kills lice and ear mites. This formula has a non-offensive odor. Safe for puppies and kittens twelve weeks or older. For best results, mix 4 oz. to 1 gallon of water. It comes in 2 sizes; 8 ounce bottle, and a gallon bottle, and the price varies according to the size of the package. It is safe for dogs, cats, puppies, and kittens of 12 weeks and older. Flea Bite Relief Treatment is not a shampoo. It is an ultra-soothing medicated solution, formulated to stop itching and irritation from flea bites fast. The treatment contains Alpha Hydroxys, which make the product far more effective than any medicated shampoo at relieving bite-related skin problems. Alpha Hydroxys penetrate the lowermost levels of the skin, cleaning out their pores and promoting healthy cell exfoliation and replenishment. The product is also enriched with oatmeal and cocoa butter, supplying soothing nourishment for healthy skin. It comes in a 12 ounce package at a price of around 11$, and is suitable for both cats and kittens.